In stock -This product will ship today if ordered within the next 10 hours and 46 minutes. Made in Japan to a classic, wheat free recipe using rice and traditional seasonings without any added sugar, MSG, colourings, preservatives or leavening agents. These puffed rice cakes made in Japan are light and crispy and low in fat. 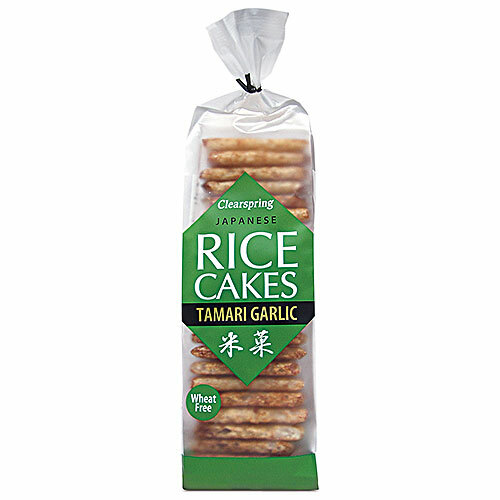 High quality and authentic Japanese ingredients have been used to flavour these rice cakes, so you can be sure that they meet Clearspring`s high standards and brand values. Rice (63%), rice flour, water, rice bran, tamari (4%) (soya beans, water, sea salt, mirin (sweet rice, water, cultured rice)), brown rice syrup (brown rice, malted barley, water), fresh garlic (1%), onion powder, sesame seeds, sea salt, umeboshi paste (japanese ume plums, sea salt, perilla leaves). 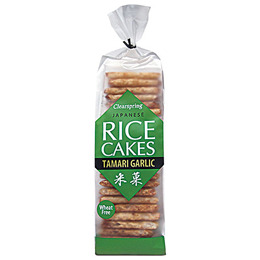 Below are reviews of Clearspring Tamari Garlic Rice Cakes - 150g by bodykind customers. If you have tried this product we'd love to hear what you think so please leave a review.